I’ve been collecting vintage jazz vinyl for nearly 25 years. This site is all about those vintage LPs and the amazing music in the grooves. Hopefully collectors of every level, the newbies and seasoned veterans of dusty record stores alike, will find it informative. I also hope it acts as a mini-reference for those who are searching for new jazz music to enjoy, even if it's not on vinyl. And, let's be honest, it's a chance for me to geek out on some of the great jazz music I have collected over the last twenty years. Unless otherwise noted, the images of the covers and labels on the site are from my collection, and all the music is recorded directly from those LPs without any editing other than a slight increase in volume when necessary. Of course, all the other images and the music on the site is the property of their respective owners. 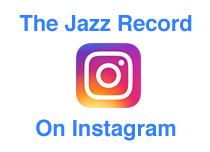 The best way to keep up on the happenings at The Jazz Record is to subscribe to our email list.